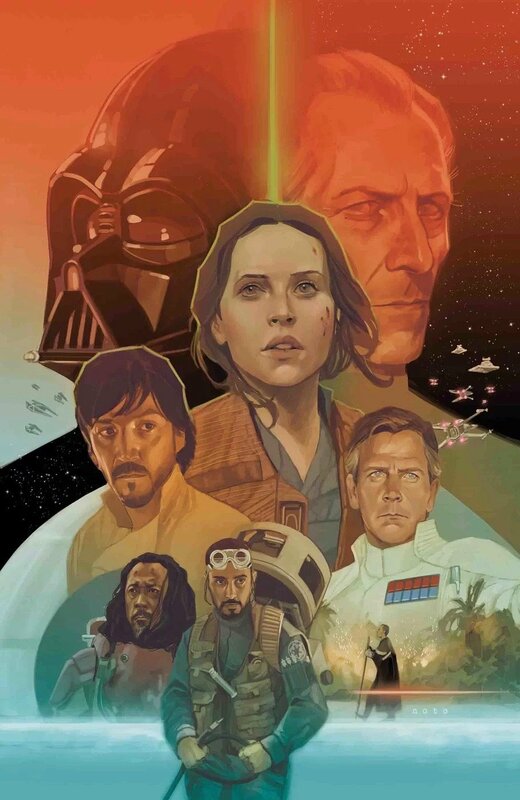 In the last issue, several soldiers in the Rebel Alliance rallied around Jyn Erso, determined to make a difference in their struggle against the Empire. These were men and women that had done and seen horrible things in their fight against tyranny. Jyn’s determination to exploit the weakness her father hid in the Death Star offered them a chance for moral redemption. Here Admiral Raddus is pleased to be informed that Jyn and company are on their way to Scarif. He’s not only pleased, he’s happy to join them. In a way, Jyn forced the Rebellion’s hand, but she didn’t necessarily twist their arm, as Raddus shows. This was an interesting moment that differed from the film. Chirrut and Jyn never had much one on one time in the approach to Scarif. Here they share a few moments, interestingly enough, as Jyn takes a look at the Kyber crystal her mother gave her. The final moments before touchdown aren’t just Jyn’s pep talk. There are some nice exchanges between individuals in the group that make this operation (and the eventual outcome) feel much more personal. Beautiful pages like this showcasing Emilio Laiso’s excellent art, which has served this adaptation so well, make me very happy. 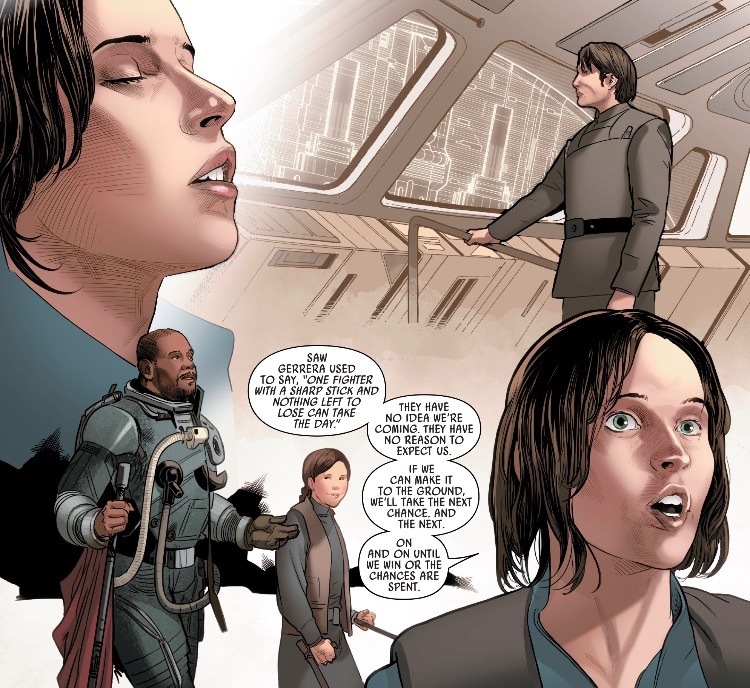 If anything has been underscored to me in this adaptation, it’s that Jyn is so aware of where she comes from and how she has come to each moment in this story. It’s another example of how strong Jyn has become on her own, finding her footing in a very uncertain galaxy, where most people would fall in line or fail under the dark tides of the Empire. Jyn honors everything about herself and that is why she is such an exceptional character. 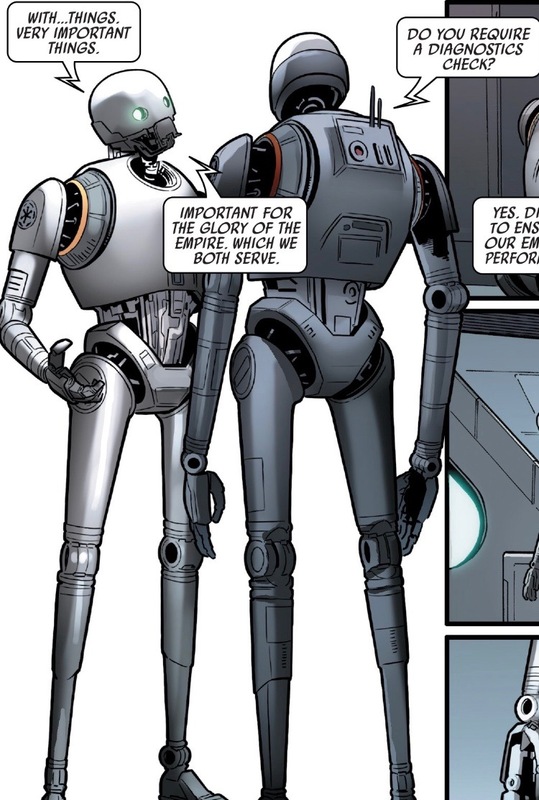 Another difference from the film, K-2SO takes out a droid to access the archives, as opposed to a dim Imperial technician. So far, this issue has the most differences from what played out on screen. I know the Gareth Edwards reshoot speculation has been discussed ad nauseam, but this makes me wonder if the adaptation is the Story Group’s way of giving us a glimpse at the first version of the film. 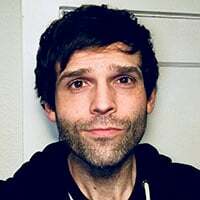 I’m not trying to make implications and that is admittedly total speculation on my part, just saying that would be an interesting way of doing it. Krennic comes across as much more sinister in these issues than he does in the film. I enjoyed Ben Mendelsohn’s performance, but I feel his approach to Krennic was to make the Director come across as much slimy than evil. I won’t argue that Krennic is not an aloof, evil slime ball, but I think a big complaint is that he wasn’t much of an antagonist. It’s hard to stand next to iconic villains like Darth Vader and Grand Moff Tarkin, especially when they are being brought to life on the silver screen. 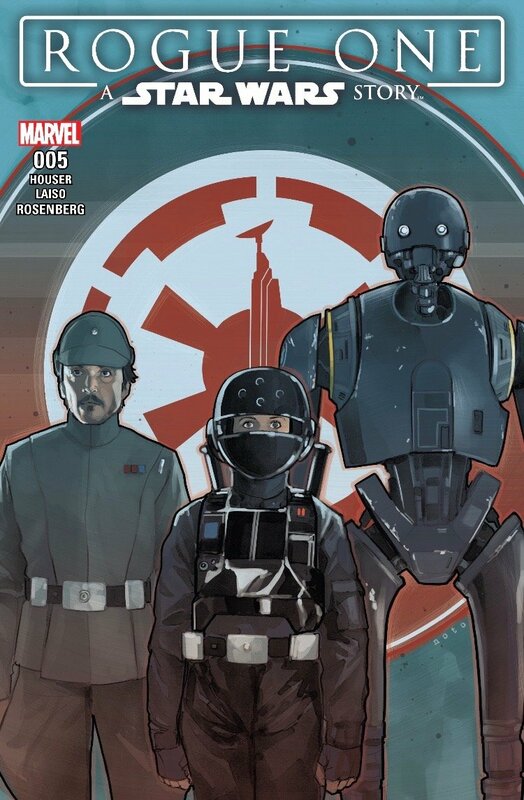 In these pages, I felt Krennic held his own as a villain much more than he did in the film. Ben Mendelsohn did a great job of making Krennic look like the nervous pencil pusher who would blow up a city to get a job promotion, but I never got the chilling feel one gets from a villain like Vader or the Emperor. It’s amazing how a few lines can completely contrast an appearance from film to ink. I just threw this in because I love that Tarkin was such a huge part of Rogue One. This frame is the essence of the character, for me at least. That cold, serious stare that I imagine Imperial officers under him fretted over to decipher each moment they were in his command. 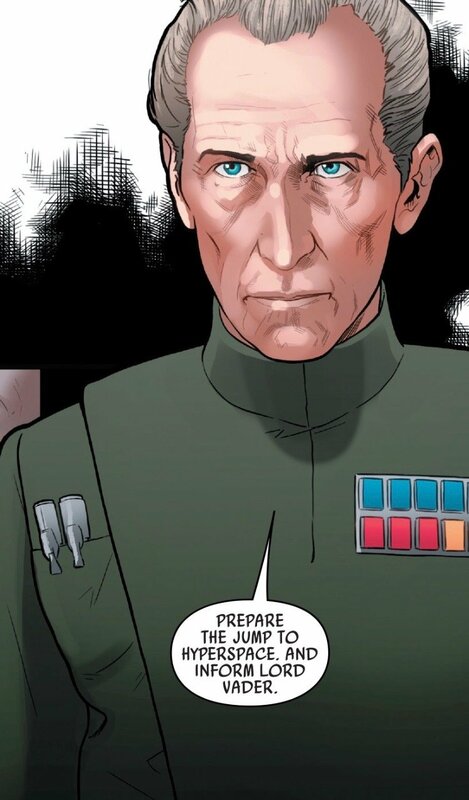 This adaptation nailed Tarkin, just as well as the digital artists who brought him to life on the screen. Hey there, Ghost! Nice to see you made it into the adaptation here, too. I’ll be looking closely as the battle over Scarif will be in full swing by the final issue. 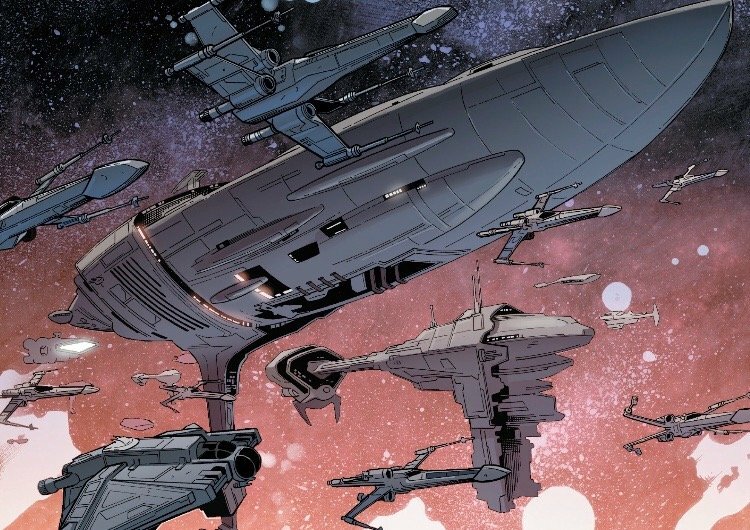 Raddus, along with a healthy portion of the Rebel Fleet, show up just as the issue ends. The Death Star had just jumped to hyperspace and the AT-AT’s were marching toward the surface battle. The end of Rogue One is near. There’s not a lot new I have to say about this adaptation here. It continues to impress me and I think it’s well worth any fan’s time to go through these pages. If you are saving your pennies for ongoing comic series or Inferno Squad (novel and/or game), then I’d say keep saving, but definitely put this on your list for future Star Wars indulgences. I’ve been waiting to watch the film again until I finish this adaptation, mostly because each time I open one of these issues, I feel like I’m experiencing the story completely fresh. If you loved Rogue One, this adaptation will only foster that appreciation. If you were on the fence about Rogue One or didn’t think it was as great as others did, this adaptation might give you a new perspective. Again, it’s not an imperative to read this and there are no mind-blowing revelations, but I think you will have a very good time reading.